Meditate. Exercise. Call a friend. These are all fairly easy things to do when you’re feeling a bit down and looking for relief. But what about when times are hard? I mean, really hard? 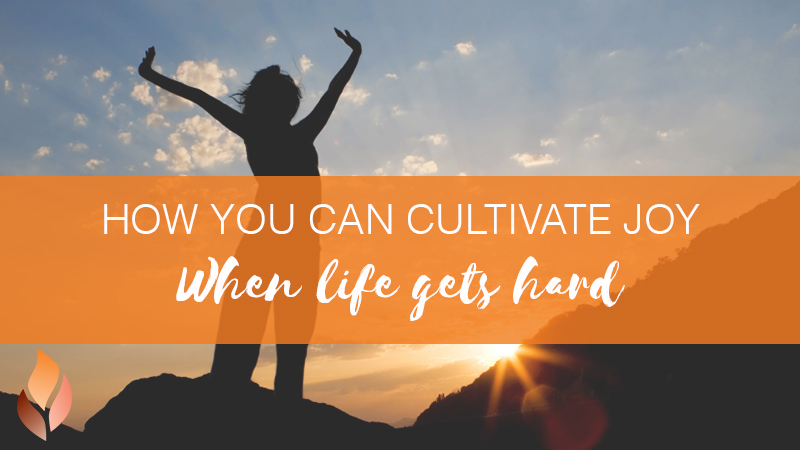 How do you find joy when you’re in the midst of grief, going through a scary transition, or facing a challenge you’re not sure how to overcome? Many of us have faced times like these—situations that bring us to our knees, sobbing into a pillow late into the night. In these moments, joy seems like a distant dream. But believe it or not, it is possible. I have survived, and thrived, through some very dark times: poverty, illness, heartbreak, loss, excruciating fear. And I’ve learned that for better or worse, shocking events shake things up and start a new era, and our biggest breakthroughs are usually waiting on the other side of a breakdown. These are the small steps that have brought me closer to joy through hardship. May they do the same for you the next time you find yourself screaming into that pillow. Fear is a powerful force that activates the amygdala, which creates a fight, flight, or freeze response in the brain. When you’re in survival mode, it’s difficult to think clearly or see things from a different perspective. That’s why it’s important to recognize when you are, in fact, paralyzed by fear, so you can take steps to ease the grip it has on you. When your world feels like it’s spinning out of control, you can’t take it on all at once. It’s important to find brief moments of lightness where you can. In a funny movie. A laugh with a friend. A beautiful sunset. In your breath. Those moments of reprieve will help your brain and body refuel so you can keep moving forward toward solutions. Feeling anxiety is a good thing since anxiety is primarily fueled by worry about the future. This means an effective remedy can often be found in the present. Regardless of what’s going on around you, peace is available in every moment if you bring your attention to what is within you. Start by closing your eyes and taking several deep breaths. The oxygen will soothe your amygdala, so it can stop sounding the stress alarm. Place your hand on your heart and bring your awareness to your body and your five senses. You can practice this anywhere, anytime, all day long. When you’ve found some respite from the paralyzing grip of fear, take actions that help you feel more empowered than helpless. Focus on solutions rather than problems, even though there are plenty of both. Change is often uncomfortable for the brain because it is unfamiliar. But now is the time to roll up your sleeves, embrace the change, and jump in, ready to embrace the growth that change brings. Fear can really take over when you become so focused on what’s right in front of you that you forget the larger picture we’re all a part of. However, remember this: We don’t see the world as it is; we see it as we are. Our brains have a built-in “negativity bias,” which means we pay far more attention to negative than positive information. Our brains are set up this way on purpose since being cautious keeps us safe. But this negativity bias can override our perception of reality to the point that we see things as much worse than they really are. So, take a step back. Is it really that bad in the grand scheme of things? Optimism decreases the stress hormone cortisol and calms the amygdala. Studies show that optimists are faster at solving problems, as well as more creative with their solutions. Luckily, optimism is a habit that can be learned. It starts with simply choosing a more positive thought or response. Gratitude is a great gateway to optimism. Even in the midst of crisis, gratitude is always an option. And the brain cannot be in a state of fear and gratitude at the same time. So, what are you grateful for today? Make a list, over and over. What works for one person may not work for you. The trick is to discover what your brain responds to and do that consistently. Make joy your goal, and watch as your perception of your circumstances shifts before your very eyes. And if your perception creates your reality, as your perception shifts, so, too, will your circumstances. No matter how bleak things may seem, often a slight shift in our perspective is all we need to create a cascade effect that changes our internal life first, followed by a quick change in our external reality.